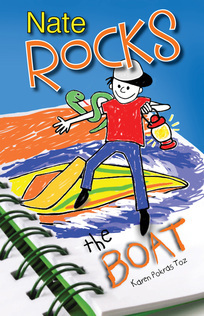 The adventures and imaginations of Nate Rockledge continue in Nate Rocks the Boat by Karen Pokras Toz. Having survived fourth grade, Nate is looking forward to spending an entire summer with his friends. His parents have decided he’ll be spending his summer a different way, however–at an overnight summer camp with his older sister, Abby. Ugh! At least he’ll have his best friend Tommy to tag along with. Best of all, his trusty sketchpad can transform him into Nate Rocks, a 10-year-old extraordinaire who battles snakes, floods, ghosts, and criminals. I was impressed with the first book in this series, Nate Rocks the World, so when I heard Toz had a new book out, I made sure to ask for a copy. This is a middle grade adventure story with a heavy dose of humor. Poor Nate has a mother who can’t cook, an annoying older sister who always tries to ruin things for him, and a father who relives his childhood by telling and retelling numerous stories of his and his brother’s exploits. In this second book of the series, Nate’s plans to hang out at home for the summer get tossed in the air when his mother announces he and Abby are going to summer camp for the next six weeks. Doesn’t everyone have one of those summer camp horror stories? I know I do. Right off the bat, I want to learn more. Toz relies on her trademark style of imagination, adventure, and humor to bring this story to life. With Camp Spring Ridge counselors, color wars, a no-neck bully, and dining room duty, Nate has a lot going on. Toz immerses the reader in that summer camp experience with a ton of laughs, some Nate Rocks adventures, and a few battle of the sexes antics. This, along with a surprise ending, will keep readers zooming through the pages. This is a perfect series for reluctant readers and those who enjoy funny adventure stories. Look for my review of the latest Nate Rocks book tomorrow, Nate Rocks the School. I received a free e-copy of this book from the author. This review contains my honest opinions, for which I have not been compensated in any way.